In Google Analytics it is very easy to set up a way to easily analyze ‘local’ local traffic. The same technique can be used to track ‘non-local’ local traffic originating from strategic areas as well. The quickest and easiest way to analyze this type of traffic is by using an Advanced Segment. We used an advanced segment in the last post to quickly highlight traffic coming from the local Google Universal Search results and compare it to site wide traffic. We’ll go through the same steps here specifying some different values for our advanced segment. To set up an advanced segment tracking ‘local’ local search traffic, first click on the box next to ‘Beta Advanced Segments’ at the top right of your Dashboard page then click ‘Create a new advanced segment’. Now you are on the Create Advanced Segment screen. Click the traffic sources drop down under the ‘Dimensions’ menu on the left. Drag the ‘City’ box to where it says ‘dimension or metric’ on the left. Leave Condition as ‘Matches Exactly’ and then enter the name of the city you want to track as the value. Note you can use State as the dimension by moving over Region instead of city. Also note if the city in one state has the same name as a city in another state you may want to add an ‘and clause’ to your advanced segment by limiting the visitors to both City and Region (state). Name the segment towards the bottom ‘City Name Traffic’ and click ‘Create Segment’. By applying this advanced segment you will now see stats for your ‘local’ local visitors side by side along with the numbers for All Site traffic. 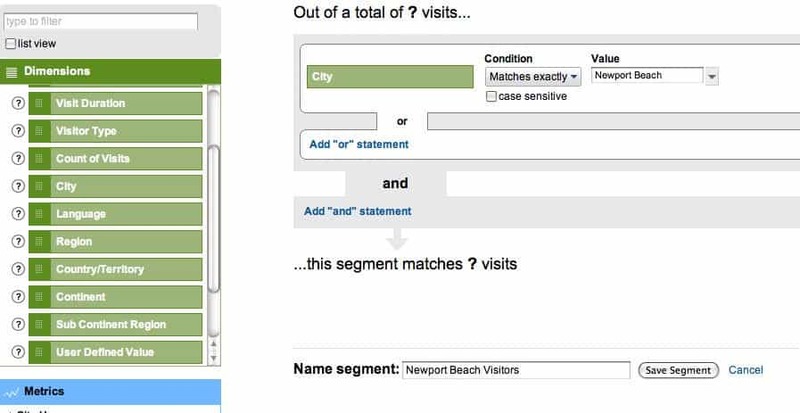 To apply the advanced segment, view the report you would like to see ‘local’ local traffic for and then click on the ‘Beta Advanced Segments’ box again, then place a check mark next to your new Custom Segment and click apply.